After the the 2014 Windy City Pulp & Paper show in April was over, I collected all the pulps, vintage paperback, fanzines, art books, and old magazines I’d acquired and packed them snugly in two boxes next to my big green chair. I’ve been digging into the boxes at my leisure ever since. I highly recommend this. Strange as it sounds, it’s a little like time travel. Most of the old magazines I bought — including OMNI, Interzone, Weird Tales, Starlog, Cosmos, Galileo, and the great Fantasy Review — are from the 80s and 90s. Which means they’re largely concerned with the same group of writers, movies, and books. 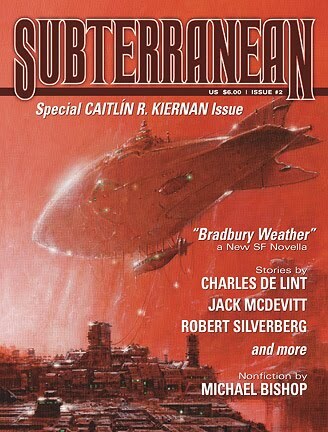 One of the great delights I pulled out of those Windy City boxes was a pristine copy of the second issue of Subterranean Magazine from 2005, back when it was still available in print. The magazine is still very much alive and excellent as ever, published these days as Subterranean Online (see their latest issue here.) But nine years ago, you could curl up with a thick issue printed on quality paper, and believe me, it was definitely worth your time. The second issue has a very impressive list of contributors, including two stories and an interview with Caitlín R. Kiernan, plus Joe Hill, Charles Coleman Finlay, Jack McDevitt, a Newford story by Charles de Lint, and a 1956 reprint from Robert Silverberg. There’s also gorgeous interior artwork by Gahan Wilson, Bob Eggleton, Richard Kirk, and Edward Miller. 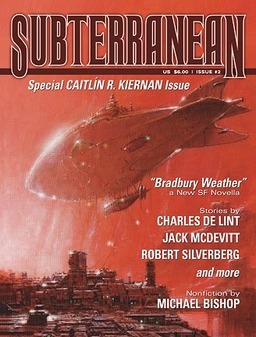 Subterranean is published quarterly by Subterranean Press. It appeared in print for seven issues before switching to an online format in Winter 2007. We covered the final online issue here. Issue #2 was edited by William Schafer; it is 88 pages, priced at $6. I bought my copy for $2 at Windy City Pulp and Paper.